Following several years of food supply instability chiefly due to violence and drought, a famine broke out in South Sudan in February 2017. Prior to this, no famine had been declared in South Sudan since its independence in 2011. At least 20% of households must be suffering from extreme food shortages. At least 30% of the population must be suffering from extreme malnutrition. At least 1 per each 5,000 inhabitants must die per day. By the middle of 2017, an estimated five million people were affected by the famine, roughly equivalent to half of the country’s total population. The most strongly affected area was the northern part of the country, towards the border to the Republic of Sudan. In June 2017, the United Nations considered the famine to be over. Still, 1.7 million people in South Sudan were living in conditions just above the threshold for famine. 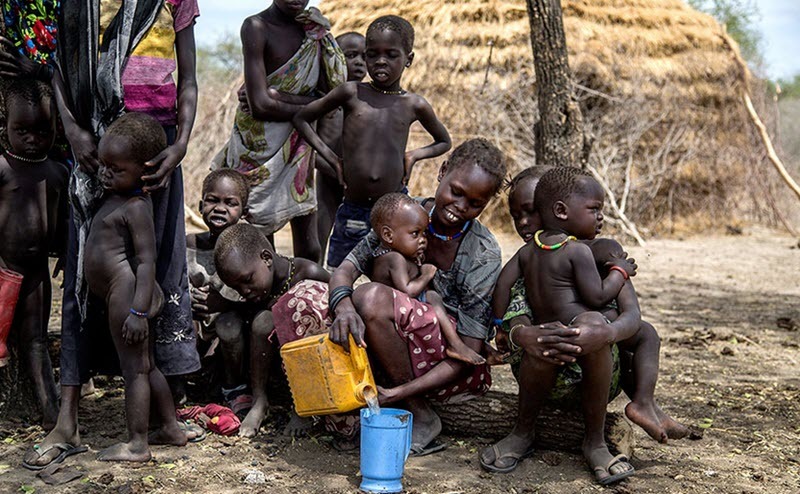 February 2015: The UN World Food Program warns about the risk of drought in South Sudan and other nearby countries. June 2015: The Famine Early Warning Systems Network observes a spike in food prices in South Sudan. This increase was believed to be at least partly due to increased transport costs and the South Sudanese Pound losing value against the USD. September 2015: Leer County (which would eventually become the epicentre of the famine) is subjected to a massacre. Civilians are killed or flee, the farms and fields are set ablaze, and the area becomes devoid of cattle. January 2016: WHO reports that existing conditions may lead to famine brought on by drought in the central and eastern part of South Sudan. March 2016: The UN reports that the South Sudan Army is not being paid in money by the government. Instead, they are given permission to confiscate anything from the locals, including cattle. The UN also reports a pattern of abuse that “suggests a deliberate strategy to deprive the civilians living in the area of any form of livelihood or material support”. August 2016: South Sudan is ravaged by a food crisis. The international community is ready to provide food assistance, but those attempts are largely blocked in South Sudan. Now, nearly one quarter of the South Sudan population is in a state of disparity. December 2016: By the end of 2016, the UN together with other relief agencies had set a new record for South Sudan by reaching 4 million people, delivering 265,000 tons of food assistance and 13.8 million in cash assistance. Still, there were parts of the country that they could not reach. On 20 February 2017, the United Nations declare famine in parts of former Unity State of South Sudan and warns that the famine can spread rapidly unless appropriate action is taken. According to the UN, at least 100,000 people in South Sudan is in imminent danger of starving to death. Also, the UN’s World Food Program reports that 40% of the South Sudanese population urgently need food assistance. “Our worst fears have been realised. Many families have exhausted every means they have to survive. The people are predominantly farmers and war has disrupted agriculture. They’ve lost their livestock, even their farming tools. For months there has been a total reliance on whatever plants they can find and fish they can catch.” – Serge Tissot of the United Nations Food and Agriculture Organization. On 21 February, an €82 million emergency package for South Sudaan was announced by the European commission. Britain’s Department for International Development had already pledged to send £100 million as a part of a package aimed to prevent migration from east Africa. On February 21, UN officials announces that South Sudan President Salva Kiir Mayardit is blocking food deliveries to certain parts of the country. “Nobody should be dying of starvation in 2017. There is enough food in the world, we have enough capability in terms of the humanitarian community. In South Sudan, UNICEF has 620 feeding centres for severely malnourished children, so the places where children are dying are places we can’t get to, or get to only occasionally. If there was access, we could save all of these children’s lives.” – Jeremy Hopkins, the South Sudan representative for the UN children’s agency. Famine was declared by the UN on 20 February 2017. Days after this declaration, the government of South Sudan increases the fee for a business visa from 100 USD to 10,000 USD. This visa is typically the visa required for foreign aid workers. The government defends the sudden price hike, saying it is necessary to increase government revenue.